DOWNLOAD THE WAVE SOFTWARE TODAY! Today's drilling devices output massive amounts of data! On top of that, you can sometimes have 2, 3, even up to 10 systems all outputting data in different formats. Can you imagine, 10 systems outputting related data in different formats and you're stuck with analyzing and comparing this data? 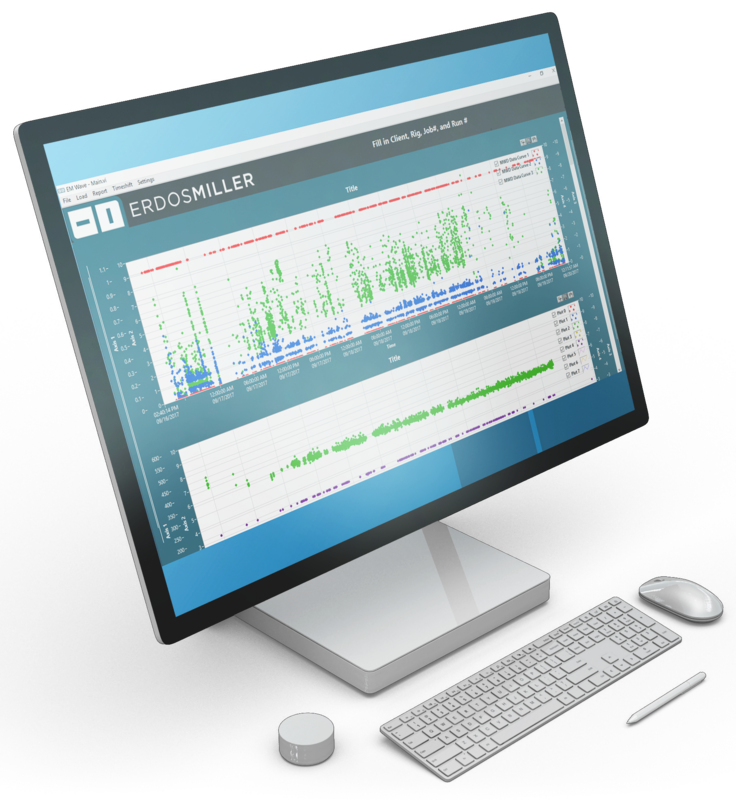 Erdos Miller's WAVE application is a data analysis software package that is focused on analyzing both real-time and recorded memory for drilling devices. WAVE provides the user with a graphical workbench which brings all this data together automatically into one consistent graphical work-space. Wave will work with computers running on Windows 7 or newer and at least 4GB RAM. Wave is vendor agnostic. Which means we can open data produced by devices from dozens of different manufacturers. Not only that, we handle all the pesky details of understanding the format of each individual file type. Wave already has a surprisingly large list of compatibility but we can easily add compatibility quickly for any data sources not yet built in. Erdos Miller: Pulse Driver, eLogger. Rime: Slick HD (Pulser Driver). Drilling data has some unique challenges. Not only is there just a LOT of data, it can often span hundreds of hours of operation. Can you imagine trying to analyze something in fine detail, say at a minute resolution, when you have over 200 hours of data? Wave is built for speed and can load in millions of points of data for easy visual analysis. 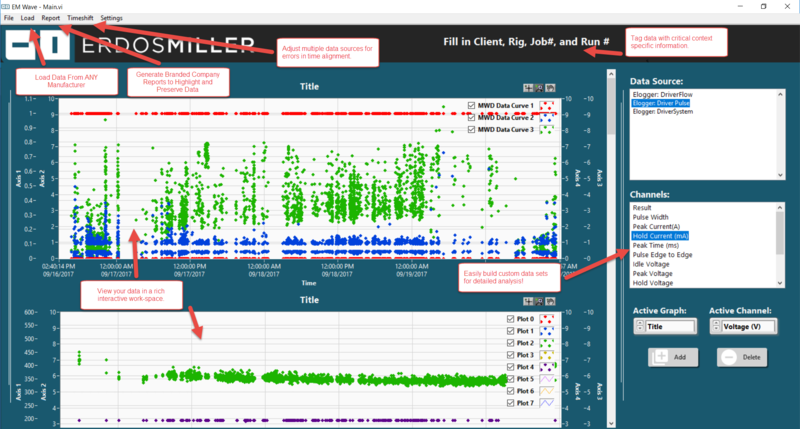 Users can easily zoom out to view the entire operational history of their data or zoom into unique events that last just seconds. Quickly pan both and forth to travel forwards and backward in time. Annotate the graph to notate interesting events. Having different data sources sometimes takes to having different datasets, so while one machine might think it's 5:03 PM, it's actually 5:07 PM. The data is all correct relative to itself, but the data is just slightly off from the time it actually was. This is critical when it comes to comparing multiple data streams together, all data sources need to be synchronized for accurate analysis. Erdos Miller Wave you correct for the time errors with easy to use software tools. Once your data analysis is complete you can generate easy-to-email PDF reports that highlight your discoveries. Reports can be branded with company logos and tagged with job specific information. These reports help your team get to the real meat of the issue and take the guesswork out of it! FILL OUT THE FORM TO DOWNLOAD WAVE TODAY! Start getting better Data Analysis today!